The CBEC has clarified that all 10 services provided by the government will be exempt from service tax. These include services provided by a government or a local authority to another government or local authority, services for issuance of passport, visa, driving licence, birth certificate or death certificate, services where the gross amount charges is less than Rs. 5,000 and legally mandated services for registration, calibration or testing. Further, services by a local body or government for assignment of right to use natural resources to an individual farmer for the purposes of agriculture, services to a gram panchayat and deputing officers after office hours or on holidays for inspection or container stuffing or such other duties in relation to import export cargo on payment of Merchant Overtime charges and services provided to business entities with turnover of less than Rs. 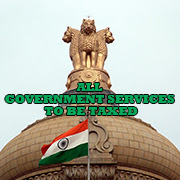 10 lakhs and negative list government services will also be exempt from service tax.